Once, a young stamp collector became a dealer for a time. Eventually, though, his youthful infatuation with stamp collecting gave way to other interests and he eventually went on to write about popular motion pictures. Perhaps you've heard of him - Roger Ebert? "As Daisy, Laura Linney plays a 50-ish single woman with great sympathy and affection for her distant cousin. Roosevelt uses her as a confident, in their first meeting proudly showing her his stamp collection, maybe as a test; later, he confides that when he's besieged by bores, they can usually be depended upon to drift away when his stamp albums come out." Philatelists know that Roosevelt wasn't just a stamp collector, as it's quaintly put in the film. His philatelic activities were many. He contributed to the design of U.S. stamps, turned Lindbergh into a philatelic flyer, promoting airmail for the USPOD -- Lindy even got his own stamp, in contravention of the post office's rules against honoring the living on a stamp -- and amassed a collection of covers, U.S. and foreign essays, special printings from his postmaster James Farley and generally used his position to avail himself of items unavailable to the common collector. On the other hand, he didn't do anything any other stamp collector wouldn't do in his position when faced by the great number of mouth-watering philatelic items available to him. It is said that Roosevelt's last official act as president was to agree to Postmaster General Walker's request that he buy the first sheet of the new Toward United Nations stamp when they went on sale on the first day of April 25, 1945. But that was not to be as Roosevelt died on April 12. It was also Roosevelt's plan that gift albums containing the stamps be presented to the delegates at the first UN Peace Conference, the event the stamp were tied into. In a document made available via the FDR Library from PMG Walker, seeking the okay of a design for the stamp and dated April 9, 1945 is the following: "As the Bureau of Engraving and Printing will have to begin work on this stamp immediately, we would appreciate your advice as to the design and denomination just as soon as possible. If you will have someone telephone us your decision it would be appreciated." Two weeks later the stamp was on sale in San Francisco, the Peace Conference took place, with the delegates receiving commemorative albums from the Secretary of State and the philatelic event in conjunction with the peace conference was itself history. It must have been a bittersweet thing for stamp collectors, though, knowing the philatelist in chief had closed his last album. And while the stamp was printed and on sale in perhaps record time, those that made cachets for FDCs were unable to update with the sad news in time. Cachets for the peace conference stamp make no mention of FDRs death, while a number, like that showing the Yalta Conference, actually picture him. 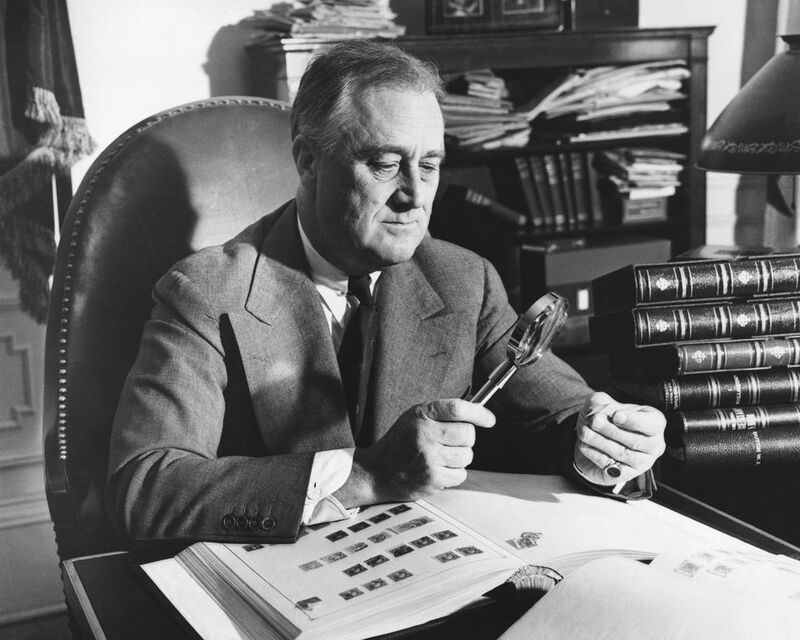 The world released many FDR memorial stamps in the months following his death and has continued to commemorate the world leader/philatelist over the years. The U.S. offered a commemorative set of three, which had their first day at Roosevelt's home in Hyde Park. The man who had famously said "I owe my life to my hobbies, especially stamp collecting," had finally himself become the subject of stamps. Immediately following his death there appeared on the philatelic market cacheted event covers, canceled on April 12, 1945, for those who want to mark their history with a philatelic souvenir. While in many cases such covers could be less than tasteful, as it may seem the maker is merely cashing in on tragedy, one could believe that FDR himself might approve. A stamp collector honored on a philatelic cover? Even for an individual of Roosevelt's status that would be a sweet coda to a lifetime in stamp collecting.